nailhed: Bois Blanc Island Pt. 2: "Due Dillingence"
Bois Blanc Island Pt. 2: "Due Dillingence"
We spent a very long time combing the island for this elusive "John Dillinger hideout cabin"...I won't reveal the exact location, but I will say that we made it a lot harder than it needed to be, heh. Because Chad's parents were concerned about time, we decided to now head over to Fire Tower Road to go in search of the Dillinger cabin, retracing our steps back over the reliable Lime Kiln Pt. Road. As you can see, the map the historical society provided was…primitive at best (the roads are not visible), and I had not brought any of my own maps--not that I had any good ones of the island. I did have a fairly decent mental image of the lay of the land from having studied aerials closely during my research, but the problem was that I was under the impression that the cabins were just off Fire Tower Rd. at the easternmost tip of Twin Lake. And from the aerial view it looked like that could be the case. However, Betty's xeroxed map showed the cabin to be further northeast, at the northwestern tip of Thompson Lake. There it was, the hideout of one John Dillinger, covered in moss in a shaded glen of spruces next to a cedar swamp. We got out and began examining the area. Again, he was hiding out here allegedly while recovering from surgery to alter his face and to remove his fingerprints, and was still swathed in bandages when he arrived. According to Betty, he should have stayed, because shortly after he left this abode, he was gunned down by the FBI in front of a Chicago movie house. Dillinger also allegedly hid in Wisconsin for a short time, while others maintain that Bois Blanc was merely a cooling off place of a couple weeks, on the way to a sister's house in the Soo area of the Upper Peninsula where he would hide out longer-term. One thing is sure--his movements in 1934 were well documented, except for that three-week stretch in June where his whereabouts were completely unknown and nothing about that time is recorded. Almost like a Robin Hood figure, Dillinger stood as a sort of folk hero to many during the Great Depression due to widespread resentment of the banks at the time, and some say that if there was any truth to Dillinger's residence on Bois Blanc, those living on the island at that time have taken the secret to their graves, as island people are naturally reticent, and loathe to meddle in the affairs of others. Another factor was the bootlegging trade, in which many islanders had allegedly been complicit. During Prohibition, there was money to be made in moving illegal booze, and many otherwise legitimate folk had a hand in keeping the spigot flowing, especially if they already made their living on the water, and needed to make ends meet. Why would they rat-out Dillinger if it would bring the attention of the law to their island and potentially to their own less-than-legal actions? Not to mention the mob might take its own retribution upon anyone who snitched on them. 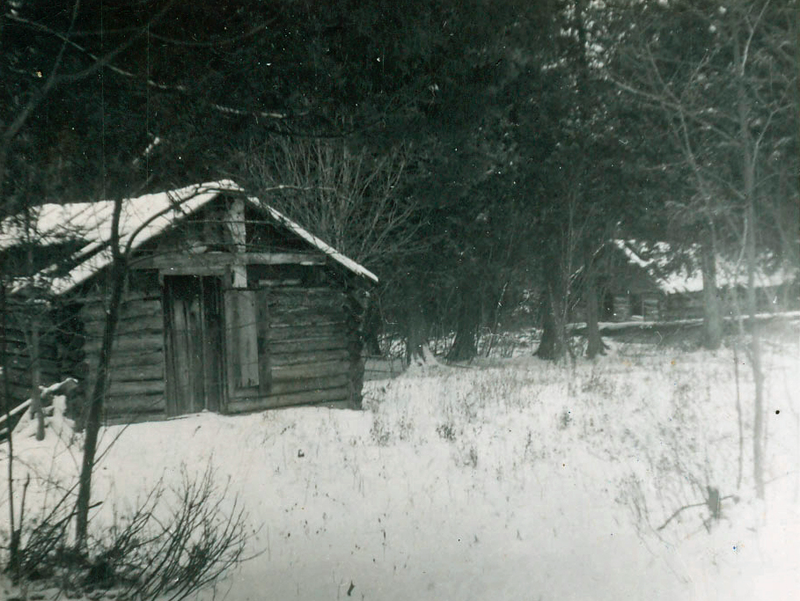 The Reeds Camp on the east end of Twin Lakes was rented by Jay Gibbons, caretaker of the camp, to a person thought to have been the famous outlaw, John Dillinger, and his companions. At the time these men were on the island, the newspapers stated that he was somewhere in northern Michigan, recuperating, after having plastic surgery done on his face. One man did all the talking and, with some islanders as his audience, displayed some fantastic target practicing with his revolver. They were often seen going to the west end in view of Mackinac Island, which was thought later to have been their means of communication. [Their] exact arrival or departure time was never known by any of the island people. A book written by A.C. Haeffner called Cabins in the Mist, goes into more detail on the topic of Dillinger's life on Bois Blanc, excerpts of which can be read on the website. …and iron debris including cans, buckets, and a stove chimney flange. Did the aroma of the infamous mobster John Dillinger's bacon & eggs go up this chimney? Did he sip the roasty product of this ancient can of Quality Coffee? When you're a famous mobster, you drink only the best of course. Behind it, monstrous cedars stood like druids of eld (little Longfellow quote there for you), guarding the edge of the bog. Looks like some kind of algae in the water. Kristen and I both peered into this bizarre morass to snap several pictures. We'd never seen anything like it before. Moving on, we got back in the car to forge northward to the shore of McRae Bay. Bois Blanc Island Pt. 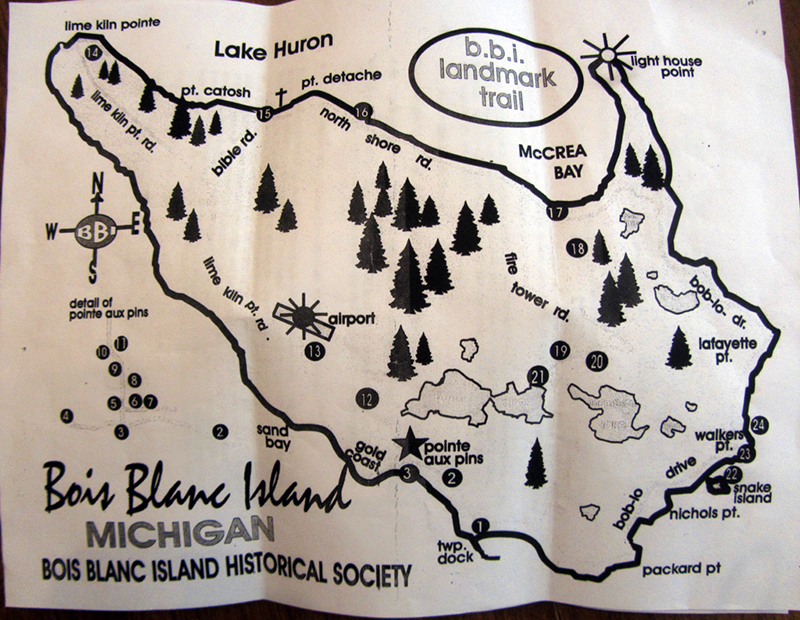 4: "All Summer Long"
Bois Blanc Island Pt. 3: "Seeking Asylum"